I read this article and wanted to share it with you: Help: I'm Scared to Teach Math and Writing! https://blog.sonlight.com/help-im-scared-to-teach-math-and-writing.html. Two subjects in particular can strike fear in a homeschool parent's heart: math and writing. You know they're crucial for your child's academic success. But you may doubt your ability to teach them well. Perhaps you struggled yourself in these subjects. Or maybe they came so naturally you don't know how to teach the process. Maybe your child is gifted in math or writing ... or maybe they detest one or the other. Whatever the case, you want to do well by your kids. Is that even possible? Let me assure you: Yes. You CAN give your children a great education all the way around. You can set them up for math and writing success. Here's the secret: you don't have to be an expert mathematician or a published author in order to help your children thrive. You just need to know your child well (which you already do! ), find some resources, and ask for outside help if you need it. You really can homeschool even if you don't know everything. It's true. Just ask my friend Jill. Curriculum is your best friend ... especially in tricky subjects. You don't need to start from scratch when it comes to moving your kids from addition to Calculus, from the alphabet to research papers. 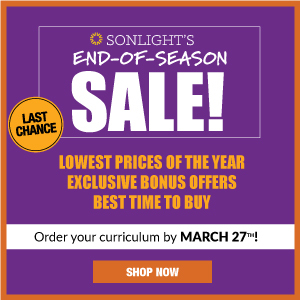 Sonlight sells several excellent math programs that will hold your hand as your student learns day by day. Sonlight students have a big advantage when it comes to writing, because they hear and read so much great writing as part of their daily school. And the Language Arts programs gradually build confident writers. Just follow along each day and trust the process. If your kids are young, you don't need to worry about how you'll teach them in high school. Just take it one year at a time. There are tons of resources available for when you do get to high school. Don't let a fear of advanced math keep you from homeschooling your Kindergartner. Many parents receive a fabulous "second education" as they homeschool their own kids. You'll be amazed at how much math and grammar you naturally pick up as you teach your children one day at a time. Dusty concepts will come back to you, and things you never understood will make sense this time around. You can get outside help when you need it! Math: Even if you enjoy learning 5th grade math along with your child, you might be ready to pass the torch when it comes to Algebra 2. 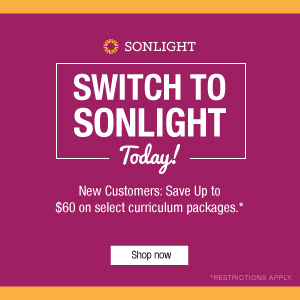 Sonlight offers math courses for high schoolers that they can teach to themselves. Many high schoolers take classes at community colleges. Your local public school might let your student take a math class there. You could hire a tutor. You could join a co-op that offers math classes. Some parents trade off teaching duties with another homeschool parent (or spouse) who is confident in math. Writing: Even if you loved teaching your child to read, sometimes you just need an outside coach to give them feedback on their papers. That's why Sonlight partners with the writing coaches at Write at Home. A personal tutor can work with your Sonlight Language Arts curriculum to coach and give feedback to your students on their papers. You could also look into tutors, co-ops and friends' help in writing as well. Judy, Luke and the team are preparing an incredible webinar on this very topic for Thursday, October 22 at 6 p.m. ET. Learn more and register here. Special guests include Brian Wasko from Write at Home and Tom Clark of VideoText Interactive. How has the journey been for you so far in teaching math and writing? 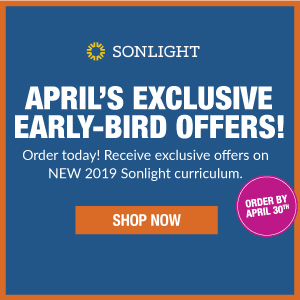 We are here to help you succeed, so don't hesitate to call a Sonlight Homeschool Advisor and/or sign up for the webinar. I look forward to one part of the webinar in particular. 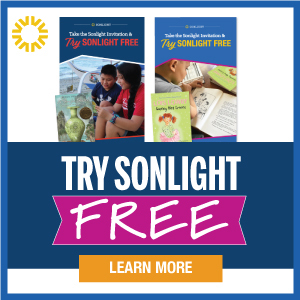 We'll hear from a mom who used Sonlight all the way through with her daughter who struggles with severe dyslexia. Her daughter used to be way behind in writing, but after years of hearing great writing through Sonlight, she really started to take off. Now she works as a tutor in the writing center at her university. We'll get to hear what that journey was like.